Today I took a drive out to a used music shop that I hadn’t visited in a few weeks. I didn’t expect to find anything, but there they did happen to have this little gem sitting on the shelf that I almost missed. 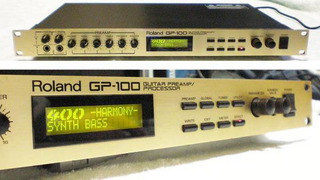 The Roland GP-100 was in mint condition with no visible scratches or marks on it at all. The manual was all torn up so it looked like the person who previously owned the Roland GP-100 spent more time with the manual than using the processor…laugh. In any event, the store had a price tag of $125 on the unit and after a little bit of thinking I decided to pick it up. After bringing it home and going through some of the effects with the guitar, I’m so glad I bought it. It’s much nicer than I thought and the reviews are quite good on the GP-100. I was excited to pick up the Roland GP-100 because I was in need of a rack effects processor mainly for keyboards and synths. I also heard that the GP-100 was used a lot with guitar synths as well, so I figured it should work out well with keyboards. I have yet to try it out with anything other than a guitar, but for guitar it’s really fantastic. All of the effects are really good and I was hard pressed to find anything really wrong with the unit or sound. I was nervous about the knobs being “jittery” but they work just fine. My Boss SX-700 had some finicky knobs which I replaced and now work fine. I also didn’t have any bad hissing or humming noises with the Roland GP-100 either. It’s really quiet and works very well. Very much like the Yamaha FX500 unit I picked up a few months ago, the Roland GP-100 has some really interesting effect patches. I’m sure one can reproduce them on more current models, but I honestly hadn’t heard some of the effect combinations before and I thought that was really cool. I flipped through the first 100 patches with the guitar and I’d say all but maybe one or two were completely usable. In fact with many I wanted to whip out my Boss RC-50 and do some looping because I thought many of the effects would worked well with ambient or chill type of music. It was very easy to find 2 or 3 effects to layer with which would create some really interesting gooves. The GP-100 instantly was a breath of fresh air despite it being an older processor and I was constantly being inspired to create something unique with the sound effects. Some of the more cool effects that I found to be totally usable were Slow Gear, most of the Reverse effects, chorus stuff, and many of the glistening tremelo and vibrato patches. Even the synth emulations were excellent. Without a doubt, if I was into creating ambient and atmospheric sounds or layers with the guitar the Roland GP-100 would be a goldmine of inspiration…absolutely! I can hardly wait to try it out on some synth and keyboard stuff. If anyone has any comments about the Roland GP-100 Guitar Preamp / Processor, please leave a note below and I’ll do my best to answer any questions. I’ll update more about experience with the Roland GP-100 as I work more with it over the next couple of weeks. Stay tune! Today I ventured over to a nearby Mom and Pop used music shop in Nagano-city, Japan. It’s a fun place, but I rarely go there because their turn around with second hand goods is rather slow, so I hardly see much new stuff there. However, today I decided to check things out as it had been about three months since my last visit. Well, I’m glad I did because to my surprise they had a “mint” condition Korg Triton Rack sitting on the counter ready to be entered into their used inventory. I asked the guy behind the counter how much they were selling it for and he had no idea. He went back and asked another guy who quickly looked it up on the computer. He came back and said $250. I said SOLD!! When I got home I inspected the Korg Triton Rack and sure enough it was in fantastic condition with no scratches or any sign of wear. In fact, the adapter looked like it had never been used. Now, I already have a Korg Triton Classic as discussed in a previous entry on my blog, but I told myself that if I ever saw a Korg Triton Rack I would pick it up because frankly, I have too many keyboards and can’t have them all setup at the same time. I figured with the Triton Rack, I could then tuck away the Triton Classic. So, I was really excited to find the Triton Rack and consolidate my gear a bit. The Korg Triton Rack came with the power adapter, manuals, and some backup floppy disks. Options already installed on the unit were (1) EXB-SCSI SCSI Interface Board, and (2) 96MB of Ram! Awesome! One of the first things I decided to do was to move the internal Compact Flash Card drive from my Triton Classic over to the Triton Rack. It fit perfectly and connected right up to the EXB-SCSI SCSI Interface Board without any problems at all. I powered up the Triton Rack and got the familiar “Unformatted Drive” error, but quickly used the Jog Wheel to adjust from Floppy Drive to the other option which was the Compact Flash Drive. Now everything works fine. I then put the Triton Rack floppy drive back into the Triton Classic for future use. I also moved both of my PCM Expansion Boards which I had in the Classic over to the Triton Rack. I currently have EXB-PCM01 Pianos/Classic Keyboards and EXB-PCM03 Future Loop Construction. I’m not sure yet if I plan to get others or not but it’s nice to know I now have six more slots available. Everything works beautifully on the Triton Rack. I am really looking forward to checking out the sampling capabilities more and make better use of the Arps plus RPPR functions. This evening I had a blast sifting through some of the Combis on the unit and it’s definitely a fun piece of gear. Back in 1984 I owned one of these in high school. I later sold it when I went to University and never played one again until yesterday. I found a good condition Yamaha DX7 for $25.00 at the local second hand shop here in Nagano-city, JAPAN. The outside condition was fair to good, but the functionally wise it was in excellent condition. In fact, I opened it up inside and it’s near mint. All of the keys, buttons, levers, LCD, controllers, etc were in excellent condition. Jacks and Midi also worked great, so I think I got a pretty good deal for a Yamaha DX7 again. Note that I originally paid around $2000.00 for the one back in 1983-84 if correct. It’s amazing how cheap they are now. Mind blowing!! Of course the sounds are dated in many respects and there are better alternatives perhaps with the later DXY, SY, FS1 versions, PLG expansions, etc. However, I felt right at home jamming on the Yamaha DX-7 once again and it feels great to find one here where I live in Japan. The gritty 12 bit sound is awesome. Yes, it’s a tad bit noisy, but like my Roland W-30 sampler workstation, it kind of has that great Lo-Fi sound. It just rocks!! I most remember how fantastic the key action was and it is nice to again play on such on such a nice and well constructed key bed. The preset sounds were there of course and they brought back lots of memories, but nowadays with the thousands of sounds available on the internet, I don’t think I’ll be using the presets much if at all. Actually, one of the reasons why I bought the Yamaha DX-7 again in addition to nostalgia from my High School days, was because back then in the early 80’s there was no internet really. There were no Youtube videos, online PDF literature, Sysex Patch Collections, Forum Discussions, or sites devoted to tips and tricks. In fact I recall just having a 600 patch book which was quite labor intensive to program into the DX-7 only to find that the sounds were not all that hot. I’m very excited about diving into the loads of info and patches on the web which I’m sure will provide a very different ( and perhaps better ) experience with the Yamaha DX-7. In addition, I registered DX Manager Version 3 a while back with my PLG150-DX plugin board. I connected the software editor to the DX7 late last night and it beautifully communicated with the DX7. I was able to transfer some patches and it seriously improved the sound of the DX7 considerably. It will also make editing much easier of course. Back in the 80’s day, you had to punch in all the parameters using the membrane buttons on the Yamaha DX7. You also had to write all the data out using patch data sheets which was time consuming. There were no fancy editors or storage methods other than the data cartridges. I think I had a few ROM Cartridges but never any RAM. 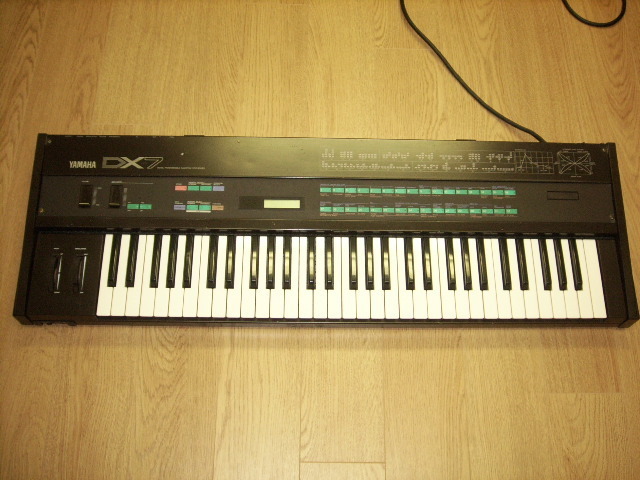 The DX7 I bought yesterday had no cartridges either and with the prices on Ebay, I think I’ll skip those. I think I’ll be able to live just fine with 32 great patches once I find my magical set. Too many patches in the box usually distracts me too much, but that’s just me I know. I’m also checking out a Yamaha DX7 Ei expansion board from Grey Matter which has long been discontinued. I’ve heard very mixed reviews on this for the DX7 MKI version and actually may leave my DX7 as is. I don’t need to have the DX7 layer, split, or do anything extra really as I can do all that via recording. I just wanted that old DX7 sound to insert into my music when so desired. It would be nice I suppose to have slightly more storage space than the 32 internal patches as I don’t like having a computer on stage, but likely, I’ll never gig with the DX7. It’s a one trick pony at this point although a very nice one!! 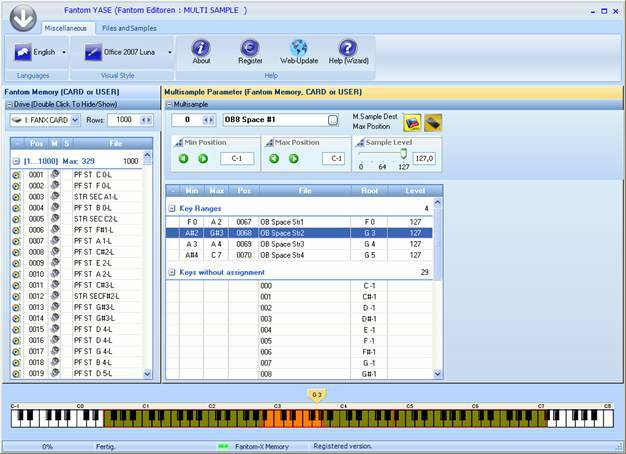 Today I purchased the software YASE from Nexoe for the Roland Fantom X series workstations. I have been doing a lot of work with sampling lately and I really needed a faster way to import samples into my Roland Fantom XR and Xa. YASE has a really nice Patch Editor that allows the entire task of importing samples to be pretty much automated. It’s fantastic, but unfortunately the interface is kind of sketchy at times. Nexoe YASE sells for $175 which is pretty steep, BUT this software is the ONLY software on the market that allows one to organize their samples and patches effective and easily on the computer. In addition, you can import any AKAI sample CD or file beautifully. If you have other formats, I just use Extreme Sample Converter or Awave Studio to convert into AKAI S5000 format. I then simply import into YASE and presto, a few minutes later I have it ready to import into the Roland Fantom XR. 1. Renaming Patches, MultiSamples, and Samples is much easier. 2. Drag and Drop organizing of samples can ONLY be done with YASE. 3. Combining and/or organizing different patches into one patch set can ONLY be done with YASE. 4. The auto assigning of Root Notes and the auto creation of Multisamples can only be done in YASE. 5. Everthing is very well organized and visually appealing in YASE. It’s fun to use. 6. The Sample Editor is nice after I solved my initial audio playback problem with it. I haven’t test much the auto loop detect ability yet, but the sample editor itself is pretty feature rich and much better than the standard Roland Fantom Editor. 7. Nexoe’s support is top notch. Something rare these days with regards to software companies on the net. There is only ONE! YASE is extremely finicky and will play with your mind it seems. I have developed a good workflow, but in the beginning I was going in circles trying to get from A to B. Despite the nice panels and layout, the code with which YASE was written in is not quite solid in my book. It feels like a “flash” website where you are constantly clicking buttons that only seem to work when they want to. Java software feels the same too sometimes. I don’t know what development tool was used for YASE, but it just doesn’t play nice sometimes and thus causes issues with workflow occasionally. Unfortunately as is common with Roland products, the free software for the Roland Fantom X is crippled. It cannot do some pretty basic and necessary functions when working with multisamples. This is where the NEXOE YASE program shines. It fills in all the gaps that are missing with the Roland Fantom X software. Is it a must buy? Absolutely if you are working with samples a lot. I am really glad I bought it. There is no review anywhere that I could find on the web for Nexoe’s Roland Fantom YASE software. It’s a good piece of software, but for $175 it can be quirky. It all comes down to what you need and is it worth that amount of money to you. For me, I have a ton of multisample patches that I want to create and load into the Fantom XR and Xa. Tinkering around all day long with the Roland Fantom “crippled” Software just doesn’t cut it. I have a need for speed and efficiency. NEXOE YASE is the answer I’ve been looking for which will allow me to get back to what I enjoy most, playing music rather than programming it. UPDATE: NEXOE RESAMPLER Roland Fantom Software Review coming soon!